Fabulous vintage medical or dental cabinet. 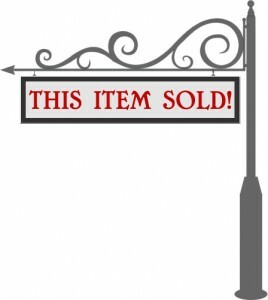 This gorgeous piece stands 66″ tall x 26 1/4″ wide x 14 1/12″ deep. Three pieces of thick beveled glass with no damage. Chrome hardware, legs, and hinges. 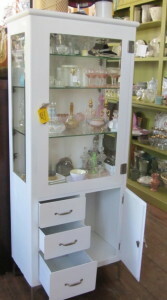 Glass shelves that are adjustable. There are a total of four shelves, I only have 3 in. Three drawers on bottom along with a cupboard for lots of storage. We have an amazing retro red chrome table with 6 chairs and the leaf! This is all original and in great condition. The table measures a little wider than most. 42″ x 54″ and the leaf is 17 1/4″. The chrome legs have been cleaned up and show very minimal age. 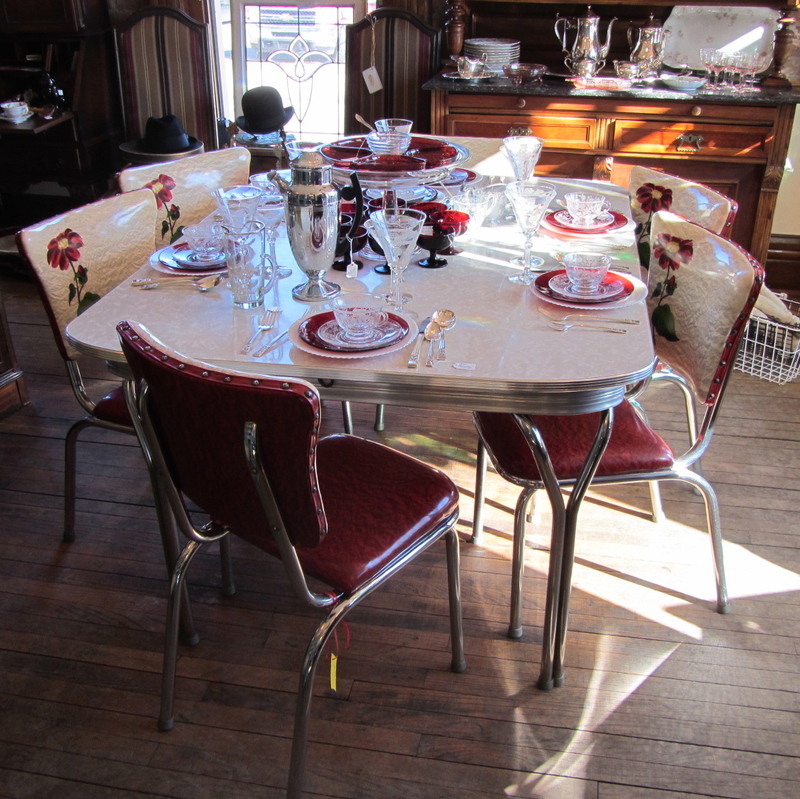 The table is grey formica in the “Chipped Ice” pattern. All 6 chairs are in great condition. There is only one tear in the chair, it does not go all the way through, just the first layer of vinyl. (see photo) The cutest thing about the chair is the hand-painted flower on the back of each of them. This is original to the chairs. The bright yellow and red flower is just happy! 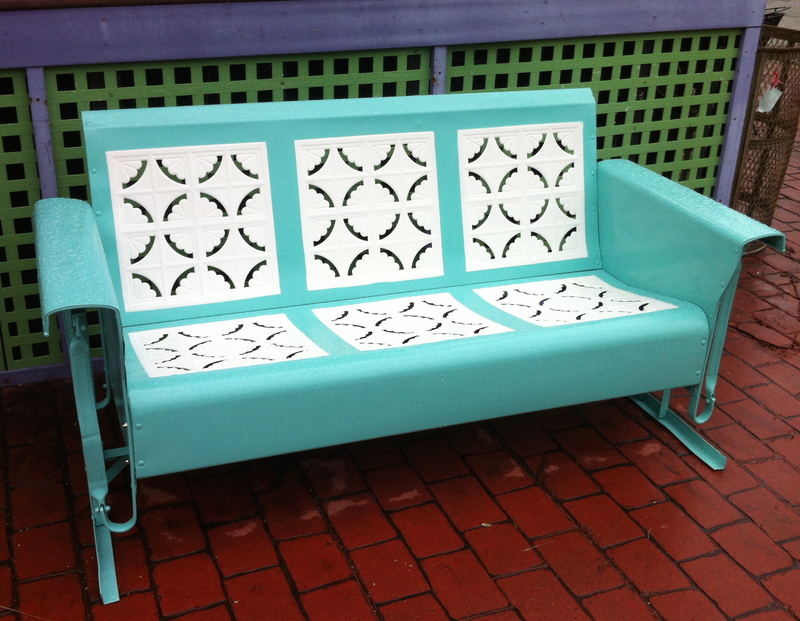 Vintage restored glider patio swing in the “basket weave” pattern in cool blue and white. 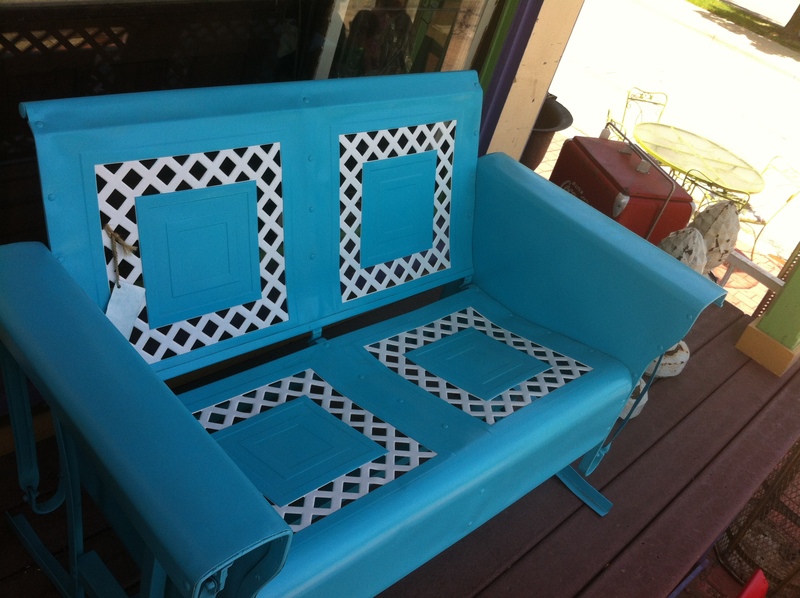 Our Patio furniture goes through a rigorous restoration process. 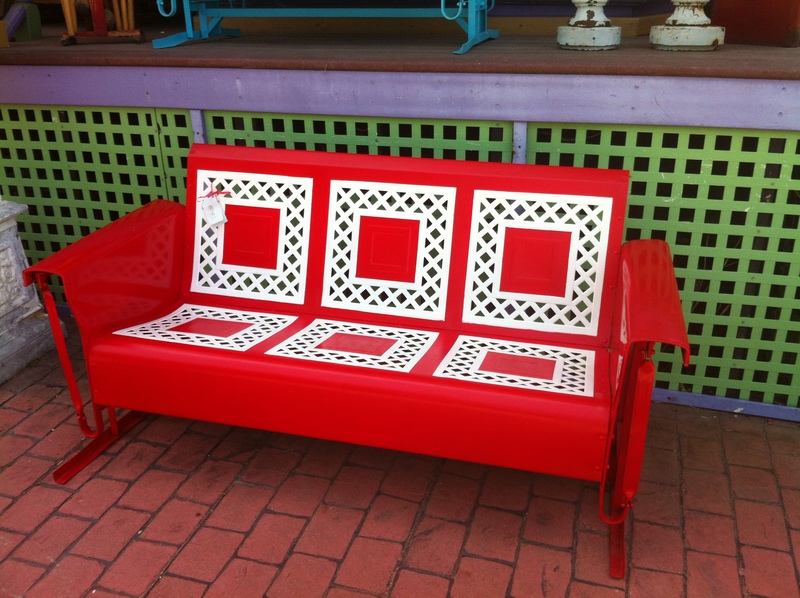 They are all sand-blasted, primed and painted with high quality enamel paint. These three seat gliders measure 64″ x 26″. These are old steel, NOT aluminum. They have stood the test of time and are ready for some more memories! Vintage restored glider patio swing in the “pie crust” pattern in green and white. Our Patio furniture goes through a rigorous restoration process. They are all sand-blasted, primed and painted with high quality enamel paint. These three seat gliders measure 64″ x 26″. These are old steel, NOT aluminum. They have stood the test of time and are ready for some more memories! Vintage glider all restored and ready to swing! This is a 2-seater but is made of steel, not aluminum. Very strong and has stood the test of time. Our patio furniture goes through a rigorous restoration process. We sand-blast , prime, and use high quality enamel paint. They are done in a professional setting. This sweet swing measures 50″ long and 26″ deep. Gorgeous vintage glider all restored! 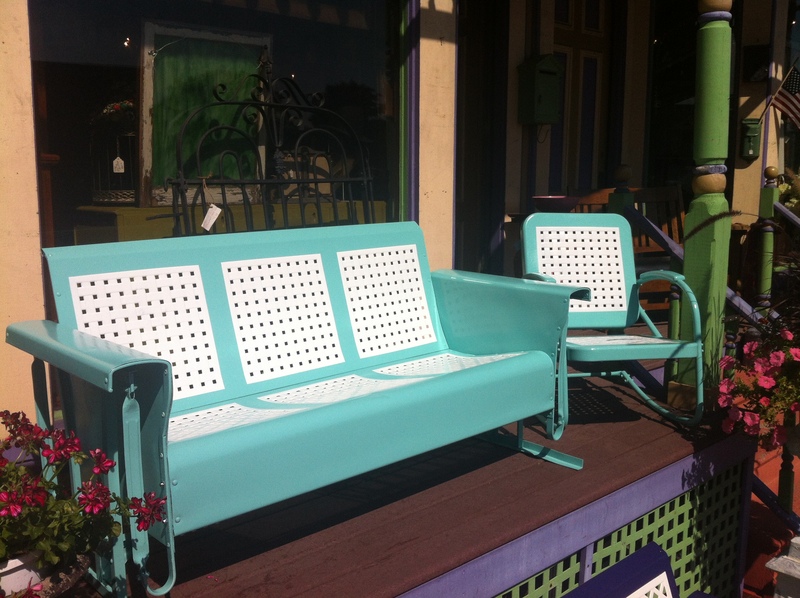 These wonderful patio pieces have stood the test of time and ready to make a few more memories! Marked on the side, this STEEL came from Pennsylvania. 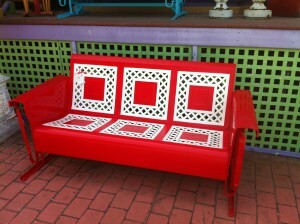 This 3-seater measures 65″ long or 5′ 5″ and 28″ deep. Nice and easy swing. Our vintage patio furniture goes through a rigorous restoration. They are sand-blasted and primed. We use the highest quality enamel paint. All done in a professional setting. This is an old wicker and wood table. 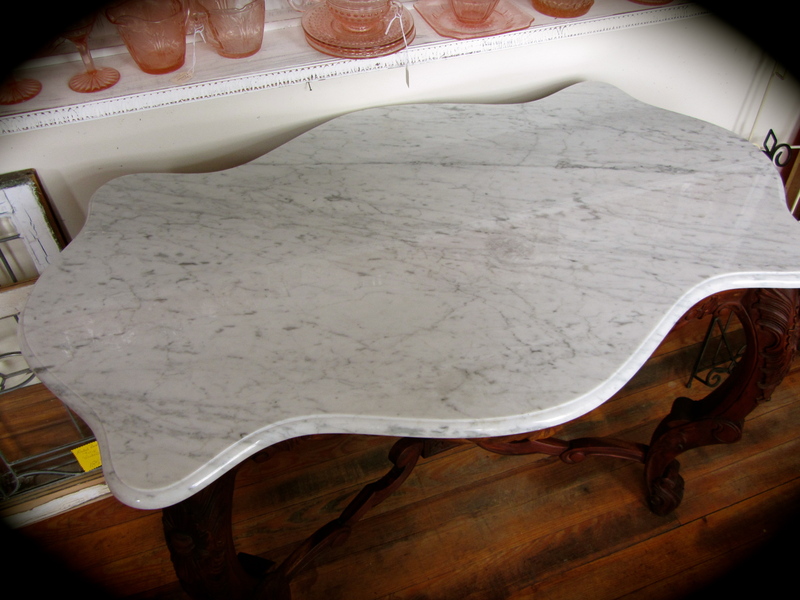 The table stands 30 1/2″ tall and is 27″ in diameter. 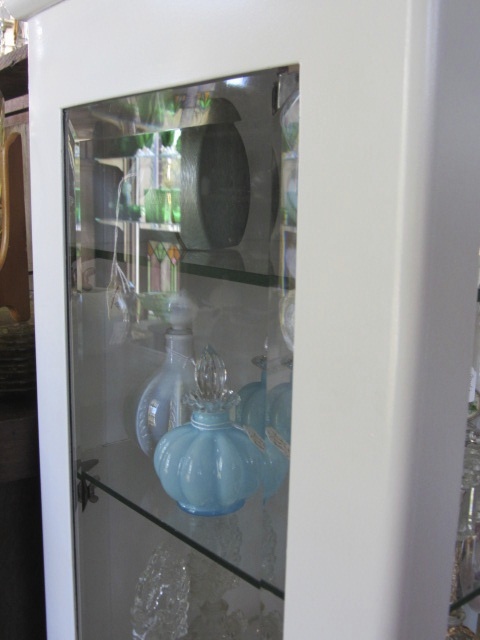 There is a 1/2″ piece of glass that sits on top. It is nice condition. We put the pennants under the glass, they are not included. If you would like to purchase them, they are $10. each. 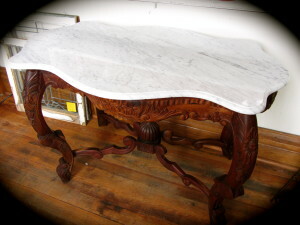 Wonderful mahogany table with marble top. 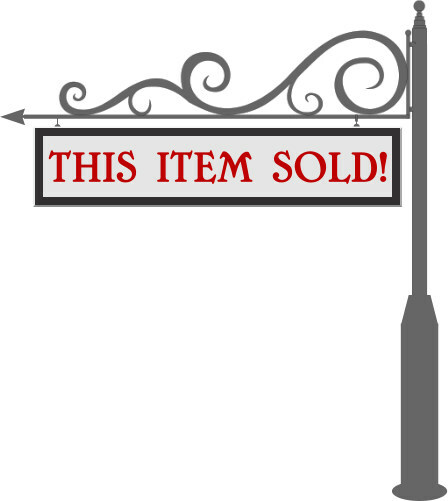 Dimensions: 43″ long x 29″ deep x 30.5″ tall. 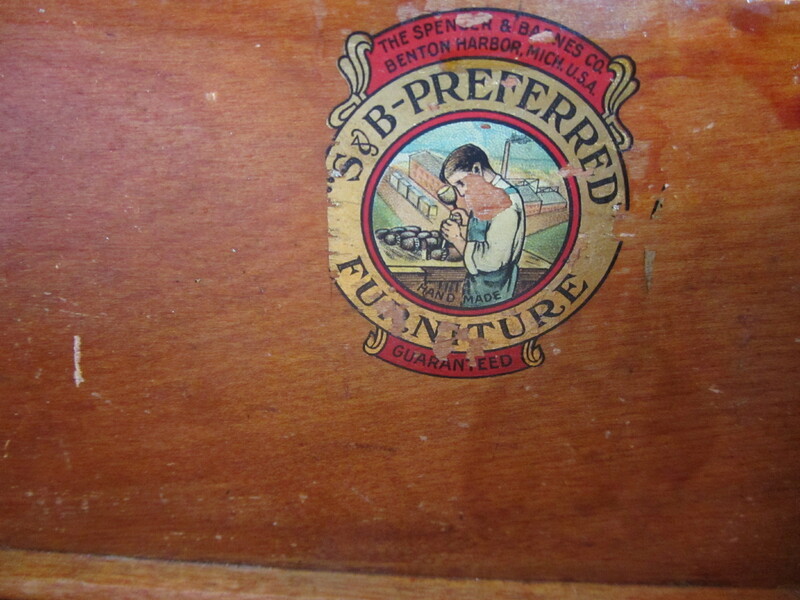 1914 S & B Preferred Furniture of Benton Harbor Michigan made this marvelous mahogany set. This bedroom outfit consists of two dressers (both have mirrors) and a full size (double) four poster bed. 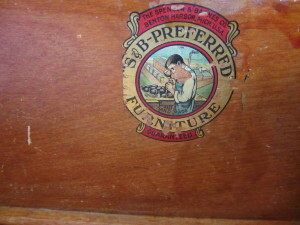 These pieces are marked on the inside of the dresser drawer: “S&B Furniture Benton Harbor Michigan”. The dresser drawers all have key holes and lock. Each drawer also has “dust covers” indicating a well made piece of furniture. All of the drawers on both dressers open and close with ease. A personally must for us! 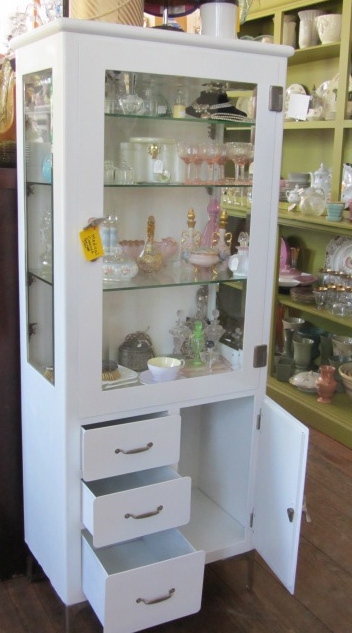 The tallest dresser measures: 36″ wide and 20″ deep Without mirror it stands 50″ and with 73″. 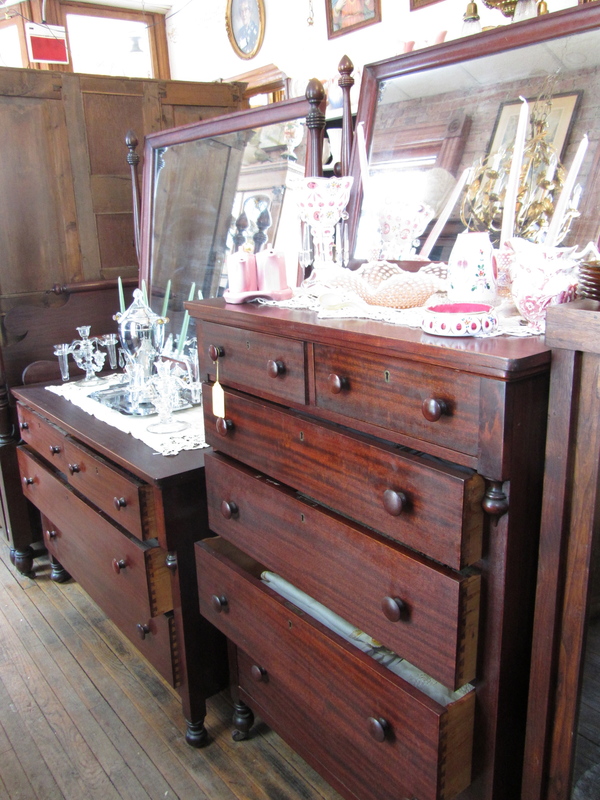 The second dresser measures: 50″ wide and 24″ deep. Without mirror 33 1/2″ and 72″ with. Each mirror that is for the dressers, fits uniquily on the top. They actually slide in from the back and have metal gear like mechanisms that you turn to tighten. The double bed has some minor scuffs on it in the normal places (like were the mattress was). The four poster actually come off and are only “pegged” in. This set is in very good condition with minor wear. None of these pieces have been stripped and refinished except for the shorter dresser. 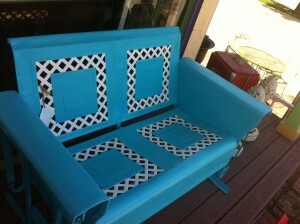 The piece has had ONLY the top part refinished. 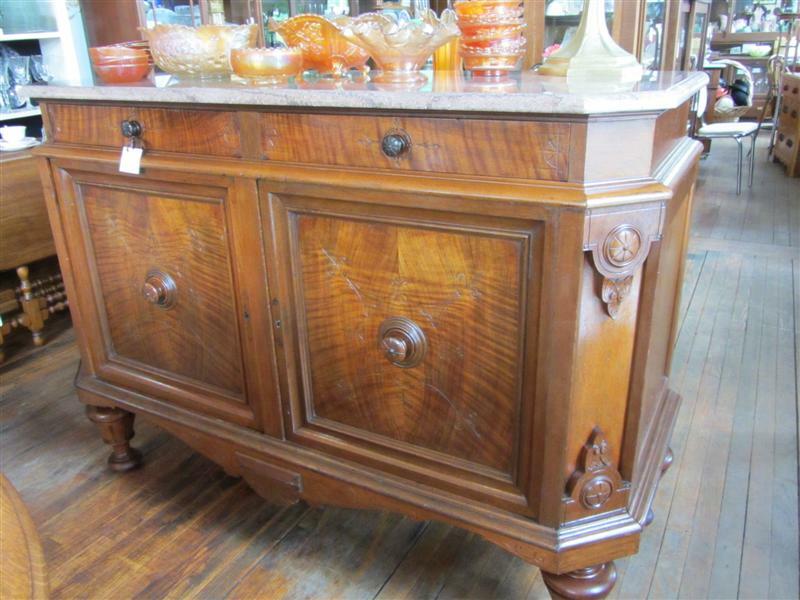 Incredible 1840’s walnut credenza with marble top. This piece is impressive with the simple yet bold design it processes. 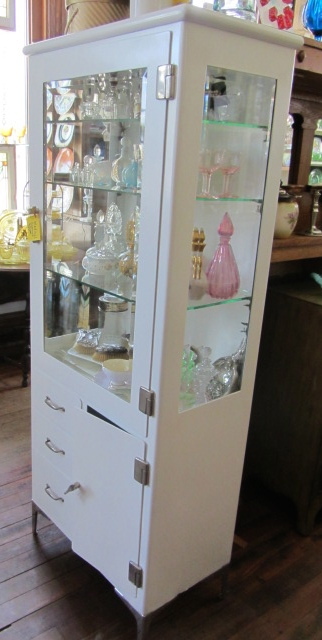 This buffet stands 53 1/2″ long x 41 1/2″ tall x 23 1/2″ deep. Two drawers on top and two cupboards below. The ends have a “cut corner” with the pattern that is the same as the cupboards. 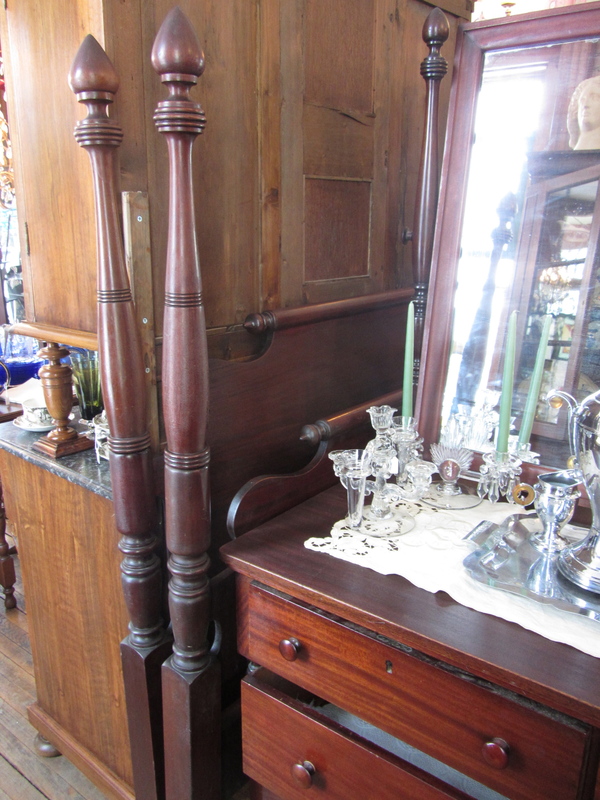 The hardware is all original wooden knobs and stands on four massive ball feet.